This is my downey v-roof box it has a 4x4 floor, louvered v-roof, side cleanout door and a predator gaurd. Includes bag of nesting material. Will feed on suet cakes in winter when insects berries and seeds are less abundant they are one of the few woodpeckers that will come to feeders. There tail feathers are rigit and strong they use them to support themselves when tapping or drumminf for insects or dig a cavatie in a tree. 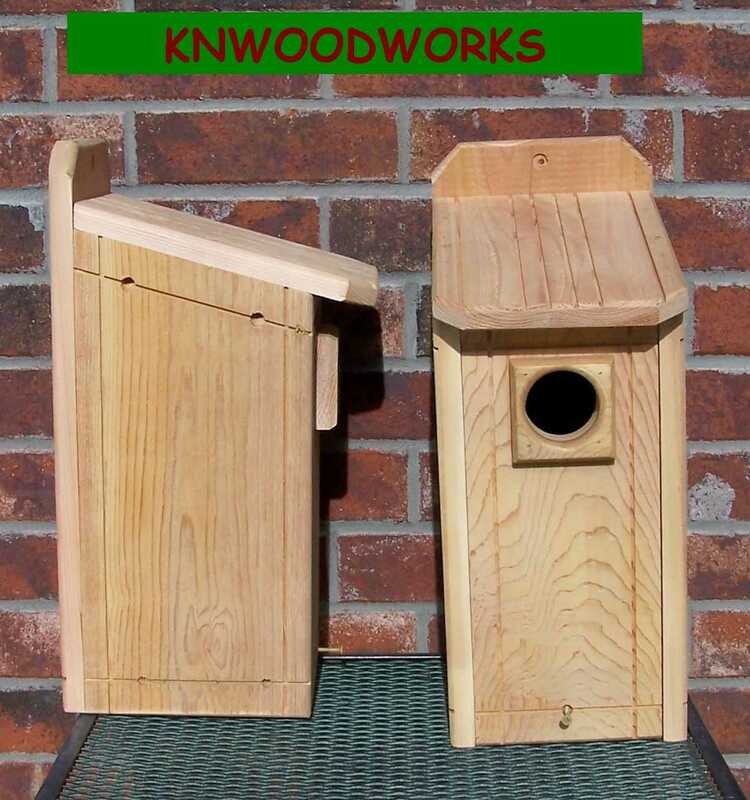 This is a red head/red bellied woodpecker box it has a floor size of 6x6" and comes with a 2" hole for red headed and 2 1/2" hole for red bellied. 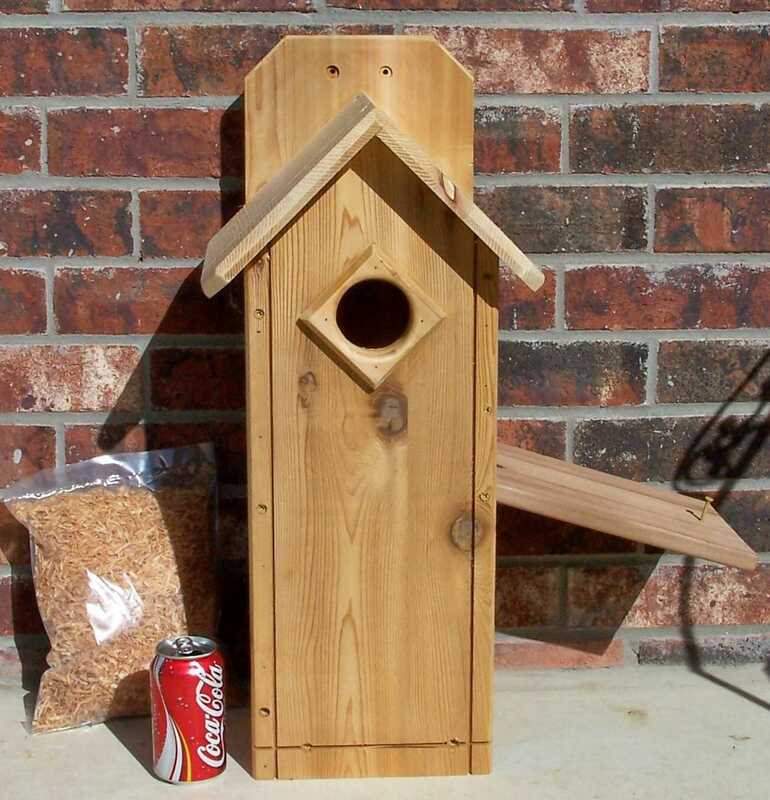 This is a northern flicker woodpecker box it has a 7x7" floor and a 2 1/2 inch hole for flickers. NORTHERN FLICKERS - IF THEY HAVE MOVED IN TO YOUR HOUSE TRY PUTTING THE HOUSE OVER THE AREA THEY ARE ENTERING (MAKE SURE THERE NEST IS EMPTY FIRST) OR THE AREA THEY ARE PECKING. *** IT IS IMPORTANT HOUSES LOOK NATURAL TO BLEND IN WITH TREES SO DONT PAINT IT. *****Woodpeckers, particularly flickers, generally have a strong desire to get in and dig. It is a important part of their courtship and breeding cycle. Give them something to do by filling the nest box, floor to ceiling, with tightly packed wood chips After they toss out all the material, add another four inches. 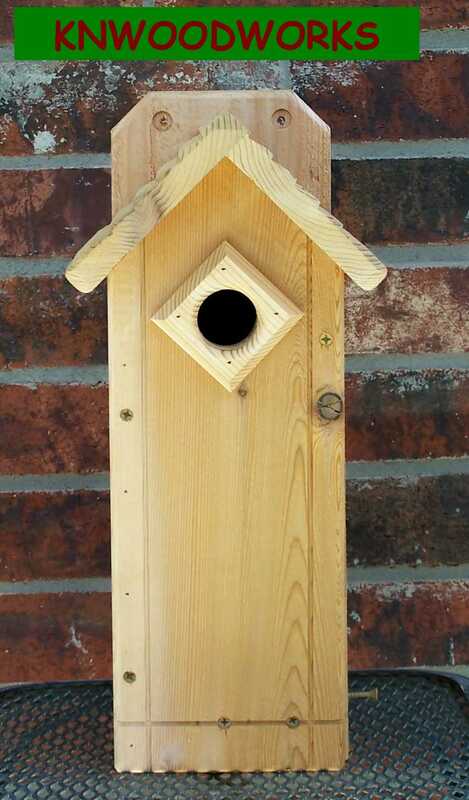 Woodpeckers that will use man made houses include - Northern Flickers . Downy Woodpecker , Hairy Woodpeckers , Red-headed Woodpeckers , Red-bellied Woodpeckers , Pileated Woodpeckers.